Influenced by artists such as Fleetwood Mac, Jewel, the Dixie Chicks, and Sheryl Crow, Kim's passion for strong lyrics and melody is evident in her songwriting. 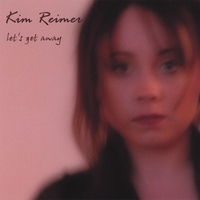 "Let's Get Away" is the debut album by Canadian singer-songwriter Kim Reimer. Influenced by artists such as Fleetwood Mac, Jewel, the Dixie Chicks, and Sheryl Crow, Kim's passion for strong lyrics and melody is evident in her songwriting. In early 2007 she began co-writing and recording songs with producer Jim Stoeber of Tegancat Music in Winnipeg. This resulted in 10 well crafted gems that range from rockin up-tempo stompers to intimate pop-folk ballads. Kim has a genuine ability to tell a story with her lyrics, a good example of this is her mysterious swamp music tale of Kalena. These great songs are complemented with top notch vocals and musicianship making for a truly enjoyable listen. Two of the songs from this new album are also included on "Listen", a Tegancat Music "various artist" CD and have been getting airplay on CBC radio. Kim's live performances range from intimate acoustic sets to full-band gigs. Musicians she performs with include Jim Stoeber (guitar, bass, vocals), Lena Hozaima (mandolin, percussion, vocals), Ron Torpey (drums, percussion, vocals) and Janice Baris (keyboards, percussion, vocals).